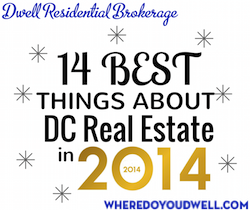 This has been a very exciting year for real estate in DC, MD and VA! With one of the healthiest real estate markets in the country, desirable neighborhoods and “cool” inhabitants, we have to say that 2014 has been an outstanding year around here. As 2014 comes to an end and we ask ourselves the question, Where Do We Dwell? We are so grateful to live and work in such an amazing city! In 2014, the average rate for a 30-year fixed mortgage fluctuated a bit, but generally speaking, hovered around 4% for the entire year. As the year comes to a close, we are dipping back below 4% to record lows. These historically low rates have improved affordability and provided a greater incentive to enter the market in the past year. 2014 has proved to be awesome for interest rates and home loan affordability and access, for sure. In October, Movoto Real Estate ranked 20004 as the Best Zip Code in America. They based their rankings on median household income, unemployment rate, commute time, median rent, median house worth, high school graduation rate and families below the poverty line. The information was gathered from the Census’ American Community Survey. Zillow just released a report this month that says buying a home in DC is now twice as affordable as renting in the DC area! What a way to end the year for all you homeowners. Renters, time to get into the ownership game now! The numbers reflect that even for buyers who have to pay mortgage insurance, because they don’t put down a large down payment. Renters on average, spend 27% of their income on housing versus the 18% homeowners spend. Go DC homeowners, you smart cookies, you! In areas with the fewest average days on the market, DC ranks #5, after Oakland, San Jose, San Francisco and Denver. In October, Realtor.com looked at all the metro areas in the country to determine their ranking. Chief Economist for Realtor.com, Jonathan Smoke, attributes this to the large amount of young professionals and those on the verge of retiring, both buying and selling homes. Eckington, Trinidad, Brentwood, Brightwood, Hill East and Takoma are just a few neighborhoods whose values are increasing substantially year over year. Many of the homes in these neighborhoods also spend fewer than 10 days on the market, which means they are becoming more popular. These neighborhoods are also continuing to attract entertainment, restaurants and shops, making them even more attractive to buyers which will continue to increase values in these neighborhoods, which is awesome. Using its online data and surveying its real estate agents, Redfin ranked Upper Chevy Chase as one of the “hottest” neighborhoods in the country. Chevy Chase is popular, according to Redfin’s survey, because of the traditional single-family homes with some green space in a quiet area, close to recreation, with a decent commute, and they are looking for that in the city, not just in the suburbs. According to the Citizen’s Budget Commission’s “Location Affordability Index”, DC is the most affordable City to Live in For Singles. How did we win such an honor? The percent of an individual’s income spent on housing and transportation. DC outranked the other 22 cities in the study such as New York City, San Francisco, Philadelphia, Austin, Seattle and Boston. DC has the highest share of first-time buyers in the country, with 68%. Due to some of the lowest closing costs in the country and an inventory that continues to move, along with high-paying jobs, it makes sense that DC would be such an attractive place for first-time homebuyers. Oh, and Dwell Residential is happy to be the one and only area real estate brokerage that focuses on first time home buyers. SW is the district’s smallest quadrant, but it’s felt some big changes over the past year, and we will see even more in 2015. It’s close to downtown and Capitol Hill, but it’s also known for it’s peaceful neighborhoods and waterfront. Townhouses, offices, apartments and government buildings are continuing to pop up everyday. The long planned overhaul of The Wharf has finally broken ground. We can’t wait to see all the new hotels, music venues, boardwalk, and shops! The American Planning Association, a non-profit made up of community planners, listed Penn Ave as one of the 10 best streets in the US. Also known as “America’s Main Street” or “L’Enfant’s Grand Avenue”, the APA explains that with all 3 branches of government, along with several federal agencies, including views of the White House and the Capitol, Penn Ave is both historical and beautiful. However, you can also find civic spaces, monuments, parks, hotels, homes, theaters and museums lining this impressive street. Home Prices continued to grow in the DC area, by about 5% over last year. Economist Lawrence Yun cites this as a healthy, stable rate of growth and has helped affordability. Given the historically low interest rates and improving jobs numbers, expect more buyers to enter the market next year, perhaps driving home prices up even more in our area. The American Planning Association put Adams Morgan on its list, praising the neighborhood for its murals, farmer’s markets, festivals and nightlife. It also offers “cool cat bars (meow), raucous music venues…quirky boutiques and global cuisine”, according to Washington.org. Remember all the construction when they were redoing the main street in Adams Morgan? Guess it was worth it! New guidelines have went into effect in 2014, making it easier to apply for a mortgage. Borrowers will see changes soon, including quicker turnaround time for applications. Banks will now give prospective buyers more consideration, allowing more first-time homebuyers into the market. According to Forbes, Washington DC is the coolest American city to live in. With its natural beauty, local eats, entertainment and recreational activities, an ethnically and culturally diverse population, a large group of 20-34 year olds and a high migration percentage, DC has a lot to offer. We already knew this, Forbes, but thanks for confirming what we know to be true every single day! We also had a very exciting year, over here at Dwell Residential Brokerage. We were the #1 Small Brokerage in the DC Metro Area in 2014! We’re so proud of all of our agents and look forward to an even better 2015! Thank you to all our clients who we were lucky enough to work with this year to help find their dream homes! We have loved 2014 because of YOU!